“Joyeux Noël”, I think, is one of the more underrated Christmas films in the oversaturated sea of Christmas specials and movies. A historical fiction film, based on actual events, “Joyeux Noël” tells how human kindness and spirit can happen in areas where even death and misery shroud the setting. Taking place during the Great War, in the awful front-line trenches, we follow German, Scottish, and French soldiers who slowly come to love and respect their enemies despite their prejudices and national identity. I think one of the reasons why I like the film so much is the stellar production value behind it. The awful scenes of war, death, and sadness are well executed. Life in the trenches is brutal and unpleasant and everyone has a chance of an unglorified death. The stillness of the battlefield, of “No Man’s Land,” is more haunting when we see the very white snow disturbed by frozen bodies and gaping pits caused by artillery shells. The costumes, make up, and props look very realistic and the added bonus of everyone speaking their native language, further pushes the realism of the film despite its fictional narrative. I think my favorite part of the film is the scene where the soldiers start singing Silent Night and the German tenor got so passionate about the song that he grabbed a small Christmas tree, climbed over the trenches and sang the song as passionately as he could while holding the tree as high as he could. Definitely a highlight of the film, that’s for sure. My two favorite characters are Palmer, the Scottish priest, and Audebert, the French Lieutenant although the other leads of the film are likable as well. Horstmayer, the Germany Lieutenant, also grows on you, especially when its revealed he is Jewish. Unfortunately, the minor characters are painted somewhat one-dimensional. In this case, I’m mainly referring to the characters comrades who did not experience the magic of Christmas and still think of their enemies as the Devil’s sons. The film also weighs a little heavy in melodrama and it’s hard not to get emotional near the end of the film. The song, I’m Dreaming of Home, is sung throughout the film by the Scots and is again sung at the end by the German soldiers as they are shipped to the Eastern Front, certain to face their sad death. Truth be told, I like the men’s choir version more than the children’s choir but either way, this song makes my heart feel heavy and I can’t help but shed a tear or two every time I watch the end. Despite its heavy-handed nature, this is a great Christmas film that I think should be watched but definitely not in a “Miracle on 34th Street” or “A Christmas Story” mood. 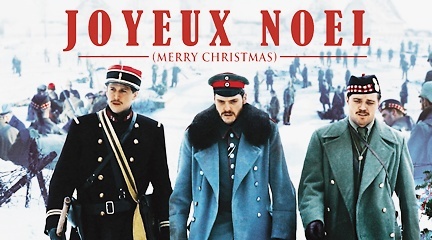 If you were in a mood to watch a historical film (or more specifically a Great War film) or you want to change of pace for your overused, annual Christmas films, give this a spin, I guarantee you that you won’t be disappointed. Merry Christmas! This entry was posted in Movie and tagged Christmas, Christmas film, French, German, great war, I'm Dreaming of Home, Joyeux Noël, Scottish, Silent Night on December 25, 2015 by Andy.